Last week's second post from AP Environmental Science comes from Justin Quimbo. This week in APES we took lots of notes on a new chapter dealing with water. I was not at school for the 25th but many of my friends told me that the APES class watched a video specifically dealing with water. * On the 26th, the class separated into groups and chose specific topics to take notes on in an online notebook. The topics were about water importance in activities such as industry and agriculture, the process of desalination, water ownership, and more. After we discussed, we all reviewed for the upcoming unit test on the 27th (today). 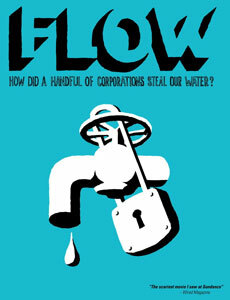 *FLOW (For Love of Water) I would highly recommend this film. It does a fantastic job of bringing to light the issue of water privatization. Clean water flowing from the tap is one of the conveniences that we regularly take for granted in America. Unfortunately, such luxuries to not exist in many parts of the world. For the most part the students seemed to enjoy the film.